We are beyond thrilled to announce that we are a Finalist for the Premier's Award for Excellence in the Arts, in the category of Arts Organization. This award celebrates outstanding achievements in Ontario's arts community and its contributions to a strong, vibrant, cultural sector through three categories: Artist, Emerging Artist, and Arts Organization. We are honoured to be included amongst such talented and creative individuals and organizations and offer our congratulations to all the shortlisted nominees and finalists, including the other wonderful organizations helping to spread the love of the arts in Ontario. "Congratulations to this year’s nominees for their excellence in the arts and their meaningful contribution to society. We know the arts enrich our lives and contribute to the well-being of individuals and communities, which is why these awards are so important and why we are committed to supporting and strengthening this valuable sector." Congratulations to all of our fellow finalists in this category and in the others. We're all in this together, and we applaud your contributions to the vitality of arts and culture in Ontario. We are proud to stand amongst you. The winners will be announced during a ceremony on October 30, 2017 at Canada's National Ballet School in Toronto. We'd like to thank the Premier, her office and staff, as well as everyone in the department of Tourism, Culture and Sport for the honour as well as their continued work to celebrate and maintain the arts in Ontario. A vivid and thriving arts community is essentially for a community to grow and to enable people to learn from one another. "It is my privilege to congratulate this year’s finalists for the Premier’s Awards for Excellence in the Arts. These artists and art organizations exemplify why our government remains so committed to supporting arts programs and activities across the province. Their works live in our theatres, galleries and public spaces, bringing people in Ontario together and enriching our communities." 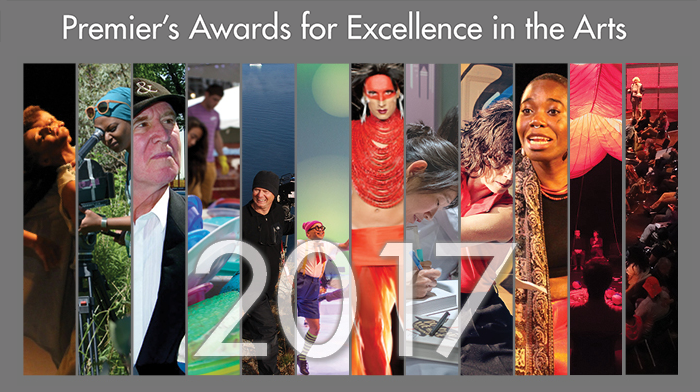 The Premier’s Awards for Excellence in the Arts program is administered by the Ontario Arts Council and recognizes exceptional achievement in the arts in Ontario. Artist and Arts Organization finalists were selected by a jury comprised of individuals from the arts and culture communities. Each Emerging Artist finalist was selected by an Artist finalist. The winning artist receives $35,000 and selects a new or emerging artist, who receives $15,000. The winning arts organization is awarded $50,000. The remaining finalists in both categories each receive $2,000. The culture sector generates nearly $22 billion annually for Ontario’s economy and supports about 280,000 jobs. Ontario has committed $50 million in additional funding to the Ontario Arts Council to be distributed over the next four years, increasing provincial funding to the OAC for arts programs province-wide to $80 million annually by 2020-21. "When people take the time to nominate a professional artist or arts organization for this important award, they are in fact recognizing the tremendous contributions that these artists or groups make to their communities and to their art form. The government’s recent funding increase to OAC is an acknowledgement that our arts community is vitally important to us, our economy, and our society’s well-being."